Great Britain and adjacent islands in the 5th century AD, before the invasion and subsequent founding of Anglo-Saxon kingdoms. Drawing of two Celtic Britons (c. 1574); one with tattoos, and carrying a spear and shield; the other painted with woad, and carrying a sword and round shield. The Britons, also known as Celtic Britons or Ancient Britons, were Celtic people who inhabited Great Britain from the British Iron Age into the Middle Ages, at which point their culture and language diverged into the modern Welsh, Cornish and Bretons (among others). They spoke the Common Brittonic language, the ancestor to the modern Brittonic languages. The traditional view that the Celtic Britons originally migrated from the continent, mostly across the English Channel, with their languages, culture and genes in the Iron Age has been considerably undermined in recent decades by the contention of many scholars that Celtic languages had instead spread north along the Atlantic seaboard during the Bronze Age, and the results of genetic studies, which show a large continuity between Iron Age and older British populations, suggesting trans-cultural diffusion was also very important in the introduction of the Celtic languages. The earliest evidence for the Britons and their language in historical sources dates to the Iron Age. After the Roman conquest of Britain in the 1st century, a Romano-British culture emerged, and Latin and British Vulgar Latin coexisted with Brittonic. During and after the Roman era, the Britons lived throughout Britain. Their relationship with the Picts, who lived north of the Firth of Forth, has been the subject of much discussion, though most scholars now accept that the Pictish language was related to Common Brittonic, rather than a separate Celtic language. With the beginning of Anglo-Saxon settlement and Gaelic Scots in the 5th and 6th centuries, the culture and language of the Britons fragmented, and much of their territory was gradually taken over by the Anglo-Saxons and Scots Gaels. The extent to which this cultural and linguistic change was accompanied by wholesale changes in the population is still a matter of discussion. During this period some Britons migrated to mainland Europe and established significant colonies in Brittany (now part of France), the Channel Islands as well as Britonia in modern Galicia, Spain. By the beginning of the 11th century, remaining Brittonic Celtic-speaking populations had split into distinct groups: the Welsh in Wales, the Cornish in Cornwall, the Bretons in Brittany, the Cumbric speaking people of the Hen Ogledd ("Old North") in southern Scotland and northern England, and the remnants of the Pictish people in the north of Scotland. 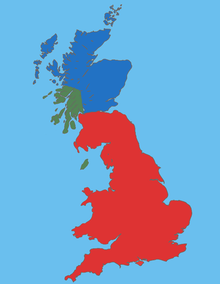 Common Brittonic developed into the distinct Brittonic languages: Welsh, Cumbric, Cornish and Breton. The earliest known reference to the inhabitants of Britain seems to come from 4th century BC records of the voyage of Pytheas, a Greek geographer who made a voyage of exploration around the British Isles between 330 and 320 BC. Although none of his own writings remain, writers during the time of the Roman Empire made much reference to them. Pytheas called the islands collectively αἱ Βρεττανίαι (hai Brettaniai), which has been translated as the Brittanic Isles; he also used the term Pretannike. The peoples of these islands were called the Πρεττανοί (Prettanoi), Priteni, Pritani or Pretani. The group included Ireland, which was referred to as Ierne (Insula sacra "sacred island" as the Greeks interpreted it) "inhabited by the race of Hiberni" (gens hibernorum), and Britain as insula Albionum, "island of the Albions". The term Pritani may have reached Pytheas from the Gauls, who possibly used it as their term for the inhabitants of the islands. The Welsh word Brython was introduced into English usage by John Rhys in 1884 as a term unambiguously referring to the P-Celtic speakers of Great Britain, to complement Goidel; hence the adjective Brythonic referring to the group of languages. "Brittonic languages" is a more recent coinage (first attested 1923 according to the Oxford English Dictionary) intended to refer to the ancient Britons specifically. In English, the terms "Briton" and British for many centuries originally denoted only the ancient Celtic Britons and their descendants, most particularly the Welsh, Cornish and Bretons, who were seen as heirs to the ancient British people. After the Acts of Union 1707, the terms British and Briton gradually came to be applied to all inhabitants of the Kingdom of Great Britain, including the English, Scottish and some Northern Irish. The Britons spoke an Insular Celtic language known as Common Brittonic. Brittonic was spoken throughout the island of Britain (in modern terms, England, Wales and Scotland), as well as offshore islands such as the Isle of Man, Scilly Isles, Orkney, Hebrides, Isle of Wight and Shetland. 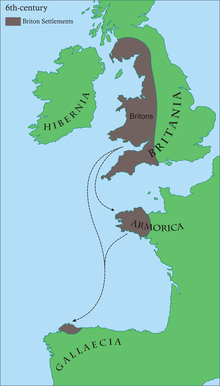 According to early medieval historical tradition, such as The Dream of Macsen Wledig, the post-Roman Celtic-speakers of Armorica were colonists from Britain, resulting in the Breton language, a language related to Welsh and identical to Cornish in the early period and still used today. Thus the area today is called Brittany (Br. Breizh, Fr. Bretagne, derived from Britannia). Common Brittonic developed from the Insular branch of the Proto-Celtic language that developed in the British Isles after arriving from the continent in the 7th century BC. The language eventually began to diverge; some linguists have grouped subsequent developments as Western and Southwestern Brittonic languages. Western Brittonic developed into Welsh in Wales and the Cumbric language in the Hen Ogledd or "Old North" of Britain (modern northern England and southern Scotland), while the Southwestern dialect became Cornish in Cornwall and South West England and Breton in Armorica. Pictish is now generally accepted to descend from Common Brittonic, rather than being a separate Celtic language. Welsh and Breton survive today; Cumbric and Pictish became extinct in the 12th century. Cornish had become extinct by the 19th century but has been the subject of language revitalization since the 20th century. Ideas about the development of British Iron Age culture changed greatly in the 20th century, and remain in development. Generally cultural exchange has tended to replace migration from the continent as the explanation for changes, although Aylesford-Swarling Pottery and the Arras culture of Yorkshire are examples of developments still thought to be linked to migration. Although the La Tène style, which defines what is called Celtic art in the Iron Age, was late in arriving in Britain, after 300 BC the ancient British seem to have had generally similar cultural practices to the Celtic cultures nearest to them on the continent. There are significant differences in artistic styles, and the greatest period of what is known as the "Insular La Tène" style, surviving mostly in metalwork, was in the century or so before the Roman conquest, and perhaps the decades after it. By this time Celtic styles seem to have been in decline in continental Europe, even before Roman invasions. An undercurrent of British influence is found in some artefacts from the Roman period, such as the Staffordshire Moorlands Pan, and it appears that it was from this, passing to Ireland in the late Roman and post-Roman period, that the "Celtic" element in Early Medieval Insular art derived. Throughout their existence, the territory inhabited by the Britons was composed of numerous ever-changing areas controlled by Brittonic tribes. The extent of their territory before and during the Roman period is unclear, but is generally believed to include the whole of the island of Great Britain, at least as far north as the Clyde-Forth isthmus, and if the Picts are included as Brittonic speaking people (as they more usually are), the entirety of Great Britain and its offshore island groups. The territory north of the Firth of Forth was largely inhabited by the Picts; little direct evidence has been left of the Pictish language, but place names and Pictish personal names recorded in the later Irish annals suggest it was indeed related to the Common Brittonic language rather than to the Goidelic (Gaelic) languages of the Irish, Scots and Manx; indeed their Goidelic Irish name, Cruithne, is cognate with Brythonic Priteni. After the invasion of north western Britain by Gaelic speaking Celts from Ireland from the 6th century AD onwards,part of the Pictish territory was eventually absorbed into the Gaelic kingdoms of Dál Riata and Alba, which became Scotland. The Isle of Man, Shetland, Hebrides and the Orkney islands were originally inhabited by Britons also, but eventually became respectively Manx and Scots Gaelic speaking territories, while the Scilly isles and Anglesey (Ynys Mon) remained Brittonic and the originally Brittonic Isle of Wight was taken by Anglo-Saxons. In 43 AD, the Roman Empire invaded Britain. The British tribes opposed the Roman legions for many decades, but by 84 AD the Romans had decisively conquered southern Britain and had pushed into Brittonic areas of what would later become northern England and southern Scotland. In 122 AD, they fortified the northern border with Hadrian's Wall, which spanned what is now Northern England. In 142 AD, Roman forces pushed north again and began construction of the Antonine Wall, which ran between the Forth-Clyde isthmus, but they retreated back to Hadrian's Wall after only twenty years. Although the native Britons south of Hadrian's Wall mostly kept their land, they were subject to the Roman governors, whilst the Brittonic-Pictish Britons north of the wall remained fully independent and unconquered. The Roman Empire retained control of "Britannia" until its departure about AD 410, although some parts of Britain had already effectively shrugged off Roman rule decades earlier. Thirty years or so after the time of the Roman departure, the Germanic-speaking Anglo-Saxons began a migration to the eastern coast of Britain, where they began to establish their own kingdoms, and the Gaelic speaking Scots migrating from Dál nAraidi (modern Northern Ireland), did the same on the west coast of Scotland and the Isle of Man. At the same time, some Britons established themselves in what is now called Brittany and the Channel Islands. There they set up their own small kingdoms and the Breton language developed there from Brittonic Insular Celtic rather than Gaulish or Frankish. A further Brittonic colony, Britonia, was also set up at this time in Gallaecia in northwestern Spain. Many of the old Brittonic kingdoms began to disappear in the centuries after the Anglo-Saxon and Scottish Gaelic invasions; Parts of the regions of modern East Anglia, East Midlands, North East England, Argyll and South East England were the first to fall to the Germanic and Gaelic Scots invasions. 6th Century AD; Rhegin (essentially modern Sussex and eastern Hampshire) was likely fully conquered by 510 AD, Ynys Weith (Isle of Wight) fell in 530 AD, Caer Colun (essentially modern Essex) by 540 AD, The Gaels arrived on the north west coast of Britain from Ireland, dispossessed the native Britons and founded Dal Riata which encompassed modern Argyll, Skye and Iona between 500 and 560 AD. Deifr (Deira) which encompassed modern day Teesside, Wearside, Tyneside, Humberside, Lindisfarne (Medcaut) and the Farne Islands fell to the Anglo-Saxons in 559 AD and Deira became an Anglo-Saxon kingdom after this point. Caer Went had officially disappeared by 575 AD becoming the Anglo-Saxon kingdom of East Anglia. Gwent was only partly conquered; its capital Caer Gloui (Gloucester) was taken by the Anglo-Saxons in 577 AD, handing Gloucestershire and Wiltshire to the invaders, while the westernmost part remained in Brittonic hands, and continued to exist in modern Wales. 7th Century AD; Caer Lundein encompassing London, St. Albans and parts of the Home Counties fell from Brittonic hands by 600 AD, and Bryneich which existed in modern Northumbria and County Durham with its capital of Din Guardi (modern Bamburgh) and which included Ynys Metcaut (Lindisfarne) had fallen by 605 AD becoming Anglo-Saxon Bernicia. Caer Celemion (in modern Hampshire and Berkshire) had fallen by 610 AD. Elmet, a large kingdom which covered much of modern Yorkshire, Lancashire and Cheshire and likely had its capital at modern Leeds, was conquered by the Anglo-Saxons in 627 AD. Pengwern, which covered Staffordshire, Shropshire, Herefordshire and Worcestershire, was largely destroyed in 656 AD, with only its westernmost parts in modern Wales remaining under the control of the Britons, and it is likely that Cynwidion which had stretched from modern Bedfordshire to Northamptonshire, fell in the same general period as Pengwern, though a sub-kingdom of Calchwynedd may have clung on in the Chilterns for a time. Some Brittonic kingdoms were able to successfully resist these incursions for some time; Rheged (encompassing much of modern Northumberland and County Durham and some areas of southern Scotland and the Scottish Borders) survived well into the 8th century AD, before the eastern part peacefully joined with the Anglo-Saxon kingdom of Bernicia-Northumberland by 730 AD, and the west was taken over by the fellow Britons of Ystrad Clud. Similarly, the kingdom of Gododdin, which appears to have had its court at Din Eidyn (modern Edinburgh) and encompassed parts of modern Northumbria, County Durham, Lothian and Clackmannanshire endured until approximately 775 AD before being divided by fellow Brittonic Picts, Gaelic Scots and Anglo-Saxons. 9th Century AD; The Kingdom of Cait, covering modern Caithness, Sutherland, Orkneys and Shetlands was conquered by Gaelic Scots in 871 AD. Dumnonia (encompassing Cornwall, Devonshire and the Scilly Isles was partly conquered during the mid 9th century AD, with most of modern Devonshire being annexed by the Anglo-Saxons, but leaving Cornwall, the Scilly Isles (Enesek Syllan) and for a time part of western Devonshire (including Dartmoor) still in the hands of the Britons, where they became the Brittonic state of Kernow. The Channel Islands (colonised by Britons in the 5th century) came under attack from Norse and Danish Viking attack in the early 9th century AD, and by the end of that century had been conquered by Viking invaders. 10th Century AD; The Kingdom of Ce which encompassed modern Marr, Banff, Buchan, Fife and much of Aberdeenshire disappeared soon after 900 AD. Fortriu the largest Brittonic-Pictish kingdom which covered Strathearn, Morayshire and Easter Ross had fallen by approximately 950 AD to the Gaelic Kingdom of Alba (Scotland). Other Pictish kingdoms such as Circinn (in modern Angus and The Mearns), Fib (modern Fife), Fidach (Inverness and Perthshire), Ath-Fotla (Atholl) had also all fallen by the beginning of the 11th century AD or shortly after. The Brythonic languages in these areas was eventually replaced by the Old English of the Anglo-Saxons, and Scots Gaelic, although this was likely a gradual process in many areas. 11th Century AD; The kingdom of Ystrad Clud (Strathclyde) was for some time a large and powerful Brittonic kingdom of the Hen Ogledd (the 'Old North') which endured until the end of the 11th century, successfully resisting Anglo-Saxon, Gaelic Scots and later also Viking attacks. At its peak it encompassed modern Strathclyde, Dumbartonshire, Cumbria, Stirlingshire, Lanarkshire, Ayrshire, Dumfries and Galloway, Argyll and Bute and parts of North Yorkshire, the western Pennines, and as far as modern Leeds in West Yorkshire. Thus the Kingdom of Strathclyde (Ystrad-Clud) became the last of the Brittonic kingdoms of the old north to fall in the 1090s, when it was effectively divided between England and Scotland. The Britons also retained control of Wales, Kernow (encompassing Cornwall, Dartmoor and the Scilly Isles) until the mid 11th century AD when Cornwall was effectively annexed by the English, with the Isles of Scilly following a few years later, although at times Cornish lords appear to have retained some sporadic control into the early part of the 12th century AD. Wales remained free from Anglo-Saxon, Gaelic Scots and Viking control, and was divided among varying Brittonic kingdoms, the foremost being Gwynedd (including Clwyd and Ynys Mon-Anglesey), Powys, Deheubarth (originally Ceredigion, Seisyllwg and Dyfed), Gwent and Morgannwg (Glamorgan. Some of these Brittonic-Welsh kingdoms initially included territories further east than the modern borders of Wales; for example Powys for some time included parts of modern Merseyside, Cheshire and The Wirral and Gwent held parts of modern Herefordshire, Worcestershire, Somerset and Gloucestershire, but had largely been confined to the borders of modern Wales by the beginning of the 12th century. However, by the early 1100's, the Anglo-Saxons and Gaels had become the dominant cultural force in most of the formerly Brittonic ruled territory in Britain, and the language and culture of the native Britons was thereafter gradually replaced in those regions, remaining only in Wales, Cornwall, Scilly Isles and Brittany, and for a time in parts of Cumbria, Strathclyde, and eastern Galloway. Wales and Brittany remained independent for some considerable time however, with Brittany finally being absorbed into France during the 1490s, and Wales united with England by the Laws in Wales Acts 1535–1542 in the mid 16th century during the rule of the Tudors (Twdyr), who were themselves of Welsh heritage on the male side. Wales, Cornwall, Brittany and the Scilly Isles continued to retain a distinct Brittonic culture, identity and language, which they have maintained to the present day. The Welsh language and Breton language remain widely spoken, and the Cornish language, once close to extinction, has experienced a revival since the 20th century. The vast majority of place names and names of geographical features in Wales, Cornwall, Scilly Isles and Brittany are Brittonic, and Brittonic family and personal names remain common. During the 19th century, a large number of Welsh farmers migrated to Patagonia in Argentina, forming a community called Y Wladfa, which today consists of over 1,500 Welsh speakers. In addition, a Brittonic legacy remains in England, Scotland and Galicia in Spain, in the form of often large numbers of Brittonic place and geographical names. Some examples of geographical Brittonic names survive in the names of rivers, such as the Thames, Clyde, Severn, Tyne, Wye, Exe, Dee, Tamar, Tweed, Avon, Trent, Tambre, Navia and River Forth. A large number of place names in England and Scotland are of Brittonic rather than Anglo-Saxon or Gaelic origin, such as; London, Manchester, Glasgow, Edinburgh, Carlisle, Caithness, Aberdeen, Dundee, Barrow, Exeter, Lincoln, Dumbarton, Brent, Penge, Colchester, Gloucester, Durham, Dover, Kent, Leatherhead and York. ^ Review by Joseph F. Eska in Bryn Mawr Classical Review (2013.12.35) of John T. Koch, Barry W. Cunliffe (eds. ), Celtic from the West 2: Rethinking the Bronze Age and the Arrival of Indo-European in Atlantic Europe. Celtic studies publications, 16. Oxford; Oakville, CT: Oxbow Books, 2013. ISBN 9781842175293. ^ Cristian Capelli; Nicola Redhead; Julia K. Abernethy; Fiona Gratrix; James F. Wilson; Torolf Moen; Tor Hervig; Martin Richards; Michael P. H. Stumpf; Peter A. Underhill; Paul Bradshaw; Alom Shaha; Mark G. Thomas; Neal Bradman & David B. Goldstein (2003). "A Y chromosome census of the British Isles". Current Biology. 13 (11): 979–984. doi:10.1016/S0960-9822(03)00373-7. PMID 12781138. ; McEvoy; Richards, M; Forster, P; Bradley, DG (2004). "The Longue Durée of Genetic Ancestry: Multiple Genetic Marker Systems and Celtic Origins on the Atlantic Facade of Europe". American Journal of Human Genetics. 75 (4): 693–702. doi:10.1086/424697. PMC 1182057. PMID 15309688. ^ "The Avalon Project". Yale Law School. Retrieved 10 August 2011. ^ Roberts, Peter (2003). Bradshaw, Brendon; Roberts, Peter (eds.). "Tudor Wales, national identity, and British inheritance". British Consciousness and Identity: the Making of Britain, 1533-1707. Cambridge University Press: 8. ISBN 9780521893619. Retrieved 18 May 2017. ^ Corbishley, Mike; Gillingham, John; Kelly, Rosemary; Dawson, Ian; Mason, James; Morgan, Kenneth O. (1996) . "Celtic Britain". The Young Oxford History of Britain & Ireland. Walton St., Oxford: Oxford University Press. p. 36. ISBN 019-910035-7. Forsyth, Katherine (1997). Language in Pictland (PDF). De Keltische Draak. ISBN 90-802785-5-6.